The so-called Kyle Busch Show has been rewritten. The 2014 NASCAR Nationwide Series season has instead been the tale of a rookie named Chase Elliott, with a few chapters on what dominance looks like (in the form of JR Motorsports), along with the fight from the little engines that could in Ty Dillon and Chris Buescher. There has never been a lack of storylines in the Nationwide Series, but the face and picture of the series have taken a vast turn. Busch has long been known as the series slayer because year after year it appeared to be nothing but the “Busch Series” long after Anheuser-Busch left the series, as he routinely won upward of eight races in a season. He, along with most Sprint Cup drivers who come down to play in the sandbox, normally ended up taking all the toys. There have been 23 Nationwide Series races thus far in 2014. Nationwide Series regulars such as Elliott, Buescher, Brendan Gaughan and Regan Smith have won eight of them. Thirteen races have been won by Sprint Cup drivers like Busch, Brad Keselowski, Kevin Harvick and Kasey Kahne, and the remaining two races were won by neither Nationwide nor Cup regulars: Sam Hornish, Jr. (part-time for Joe Gibbs Racing) and Ryan Blaney (full-time Truck Series driver running part-time for Team Penske). Great racing remains – and whether it is liked or not, having Sprint Cup drivers in the field helps produce great racing. 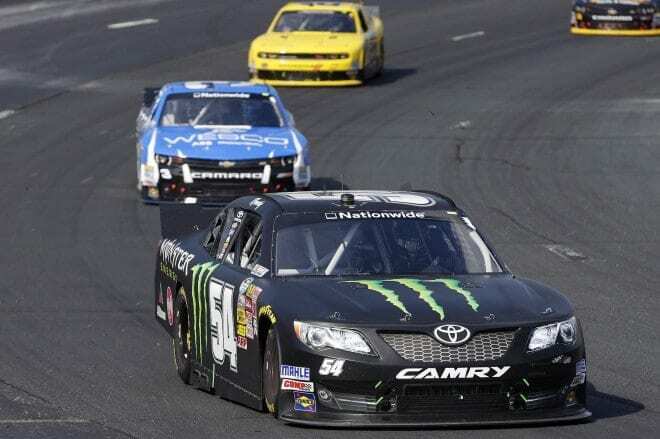 But while most of the narrative continues to revolve around Kyle Busch and what he is or is not doing on a weekly basis, the ending has become quite different in 2014. 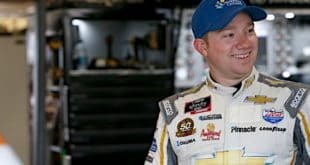 The proof is in the numbers, because this time last year Busch had already won nine Nationwide Series races and would end the season with a total of 12. Fans know and acknowledge, begrudgingly, that Busch wins a lot. It’s part of – or perhaps the biggest – reason there has been so much disdain for the Nationwide Series compared to years past. And it’s not a Sprint Cup Series driver problem – it’s a Kyle Busch problem. 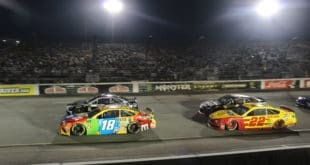 But Ryan Blaney at Bristol Motor Speedway highlighted what the 2014 season has been about: Busch isn’t winning as he once was, and that’s just a big storyline as who does end up in Victory Lane. 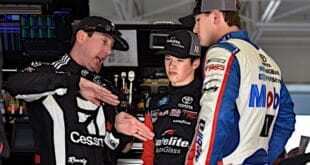 What Blaney did last Friday night in Bristol was show that times are changing in the Nationwide Series. 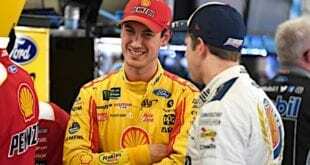 The kids are no longer content to play second fiddle to the Sprint Cup stars and are eager to show that they are just as good as the drivers they were once told – and thought – they couldn’t beat. Blaney aced the Food City 300’s final restart, whereas Busch either spun the tires, got jacked up from behind, as he claimed – or even both. Either way, Busch didn’t get going, and Blaney scored his second career Nationwide Series win. Busch went on to finish second for the fourth consecutive race he’s been entered in. He remains winless since June at Dover International Speedway, which was only his third win of the season. However, without the wins, he continues to rack up numbers like it is nobody’s business. He’s led 901 laps this year and has finished either first, second, third or fourth in every race except for one (Daytona in July, where he was 17th) in the 17 races he’s run. That is not an exaggeration, but something you have to see to believe: Busch has only finished worse than fourth in one race this year. Busch is good, very good – only now he’s become beatable. Keselowski did it at Las Vegas and Loudon. Kyle Larson did so in Fontana. Elliott won his first race at Texas with Busch finishing second. Dillon outran him late at Indianapolis. Then Blaney added to it at Bristol. Busch has been left empty-handed more often than he would like, but that happens to be what pleases the masses. It can be spliced and diced, dissected and discussed whether Busch is beating himself, losing his touch or whichever argument fits the mood. Fact is, this has been a long time coming; Busch hasn’t lost anything and remains the driver to beat. Instead, the winds of change are finally blowing through, and there is not only competition for him and other Cup stars, but competition that is equally matched. That’s what the real show is: a variety of winners. It all makes the “Kyle Busch wins too much argument” a little more invalid. Nope, it is the five car Cup extended practice no identity non racing series. Maybe the eventual “champion” can finish sixth two times in a row. Exciting!